133 people in our community are currently praying with you. Who am I, that the eyes that see my sin? The night has passed, and the day lies open before me. As I rejoice in the gift of this new day, so may the light of your presence fill me with love for you and my fellow man, holy God, Father, Son, and Holy Spirit. Abide with me, I pray, now and for ever. Zebulun - "he shall become a haven for ships"
"Benjamin is a ravenous wolf"
Simeon (fortified town) - "weapon of violence"
"Asher's food shall be rich"
"Naphtali is a doe that bears beautiful fawns"
Gad (tent) - "Raiders shall raid Gad, but he shall raid at their heels"
"Joseph is a fruitful bough"
"Dan shall be a serpent in the way"
"Issachar is a strong donkey"
Reuben - "unstable as water"
All these are the twelve tribes of Israel. This is what their father said to them as he blessed them, blessing each with the blessing suitable to him. This is a great moment in history, for it is the moment in which the time of the lone patriarchs end and the twelve tribes of Israel are declared. Abraham, Isaac and Jacob were each an individual man. God has promised that their seed would be as numerous as the grains of sand; and here, the fulfillment of the promise begins. Joseph has been declared the head of what is no longer a tribe of nomads, but a seedling nation. Although there are only about 70 of them, the Hebrews are now the nation of Israel. 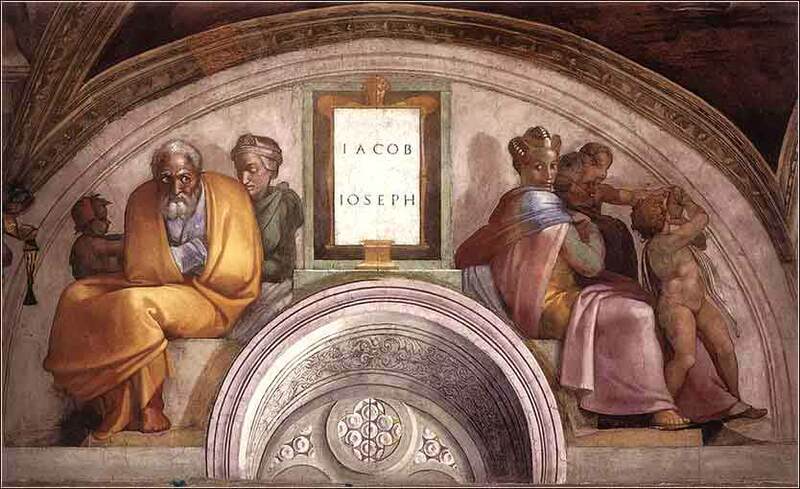 Jacob will be buried in Canaan, in the tomb of Abraham. Not only does he have a natural inclination to be buried with his ancestors, in the home of his heart, as many people do; but also, he wants to establish that Canaan is still the land of the nation which bears his name – not Egypt. It is a sign he gives to his sons and his generations to come, that they are living in a strange land. No matter how long it will last (and it will last for centuries), their life in Egypt is a temporary sojourn. God has promised them the land of Canaan, and they will eventually return to it, for it is the home of their God and their destiny.